Can anyone recommend a blue blocker screen for TV's? I'm growing tired of watching the news with 2 pairs of glasses on! (My RX and then my Uvex). Lowbluelights.com used to sell one but they don't anymore....any ideas? Rubicon mentioned something I believe in Mexico. He had it on his laptop if memory serves. WarrenT and Rubicon like this. Cool product. Is it a half-truth though, like f.lux? I think so, they target narrow range of blue in the 460-480nm range so green remains. According to this paper Effect of light wavelength on suppression and phase delay of the melatonin rhythm The shorter wavelengths of 470 (blue), 497 (blue/green), and 525 (green) nm showed the greatest melatonin suppression, 65% to 81%..so this implies that even with blue blockers you are getting some level of melatonin suppression with artificial light. Sort of like flux.com but for TV. "Removes blue signal from the red-green-blue signal according to desired intensity." That is there is still blue remaining, just of lower intensity. I assume that we do not need any blue at night. Actually green is also undesirable. I was telling Jack in Mexico about how good the blue blocking ability of Android phones are compared to iPhone because of apps like Twilight that make the screen really red. 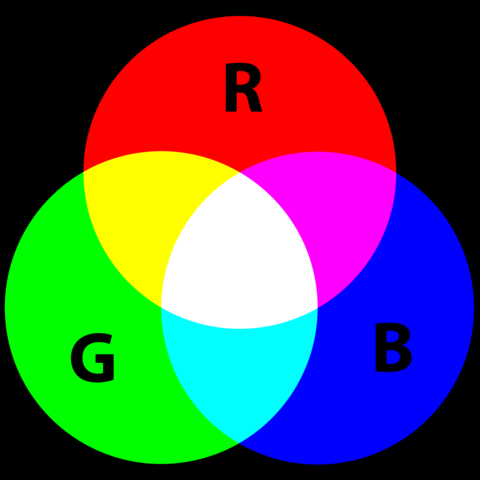 However, after recently testing with the RGB image I'm not sure if Twilight removes much blue after all. I would like to see exactly how the RGB image would appear on a Nightshifted iPhone. I may try a plastic blue blocking phone screen filter in the future to see how that compares. I bought some custom sheets of Rubylith on Ebay that fit my computer monitors. They block all blue, and nearly all green. I set my computer monitor to 900K if I use it in the evening, and on a laptop that connects to the TV in the living room for when I'm occasionally watching video. WarrenT, gaenor, PaulG and 1 other person like this. shah78 and cmegan like this. lowbluelights told me that they stopped selling the larger filters that cover televisions because the optical quality of them was not very good. I think they said they still had some left, so you could try getting in touch with them directly to discuss. I went looking for a large screen protector bc, like you, I was uncomfortable with my rx plus uvex over but I never found anything that really blocked any significant blue. I expect most people will only tolerate a very mild tint on a filter (like blutech) and anything else is not going to sell to the mainstream market, so there isn't anyone doing those as far as I can tell. Night shift is worthless on iPhones but for some rI haven't seen anybody mentioning the new-er capability the iPhone has with iOS 10. Its called display accommodations and its better than twilight on my friends android and puts the jailbroke F.lux I used to have on my iPhone to shame. Settings--general--accessibility--display accommodations--color filters--turn color filters on--select color tint--drag intensity & hue bars all the way to the right. Using rubicons pics above I cannot see the red or the green. Occasionally this makes it really hard to see some things on the phone that are colored primarily blue/green but that can be fixed by turning on the gray scale which just adjust the relative colors of everything so its like looking at a black and white screen but dark red and light res instead. This video shows us how we are being visually tricked by "Oz Behind the Curtain" and why we need blue-blockers and mitigation strategies against artificial lighting. Seizure Warning! I only watched a few sections of this video with my blue-blockers, shrunk down my web-browser to a very small view and listened (audio) to most of the video rather than viewing it. But it's a great resource to show what goes on in front of you! Is anyone using a blue-blocking filter for your computer monitor? I wear Ra Optics 450nm daytime yellow but I'd also like to filter my work computer during the day to protect my skin. but they claim to block 100% up to about 540nm and are intended for evening use so probably not good during day job. I'm not allowed to download color tweaking software. Based on this review: https://glarminy.com/blue-light-screen-filters/ I purchased a screen from Reticare for my work computer and home laptop. I also wear Gunnar readers. I have one for my computer. Im diggin it.